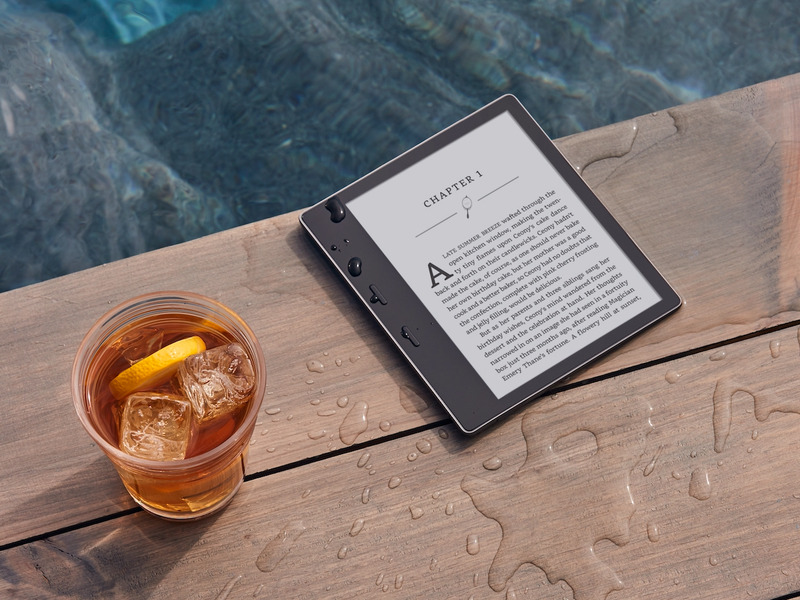 This year, with the tenth anniversary of Kindle, Amazon has introduced the Kindle Oasis to replace last year's model. Finally, after years of consumers' requests, this model is waterproof. The new Oasis has a bigger screen, better battery life, and a built-in Audible app. As an improvement on last year's model, Amazon has increased the screen size from 6 to 7 inches. Even distribution of light makes for a brighter display, now with 12 LED lights. Ambient light sensors adjust the brightness of the screen whether inside or outside or moving from room to room, depending on the amount of light available in the given area. With the strongest glass used to date, the display however remains at 300ppi. Instead of plastic, this reader will have an aluminum back. A thick side fits a bigger battery and allows for one-handed reading. The Oasis's built-in battery can be fully charged with the micro USB port in two hours, which gives 6 weeks worth of battery life. The reader was tested by submerging it into 2 meters of water for 60 minutes, even in different environments such as pools, hot tubs and bubble baths. Having finally delivered on a waterproof Kindle, Oasis has a rating of IPX8 for its superior ability to withstand water pressure. On account of the built-in Audible app, a licence to Audible version of books can be bought. The Oasis allows for users to Bluetooth an audio book to headphones or speakers since there are no built-in speakers or headphone jack. Users can easily switch between text and audio versions of books. Only the earlier Kindles with wireless connectivity will later receive the Audible features through software upgrades. Other features include the inversion of a black and white display for photosensitivity. The Oasis includes 14 font sizes with up to 5 levels of boldness, and the ability to bold any font. Increased screen size means larger text, book and library icons. Files supported are PDF, TXT, MOBI and PRC. There is also a physical page turner as well as touch screen options. As good news for left-handed users, the screen rotates to the orientation of how it's held. The Oasis also has a dual-core 1GHz processor and 512MB RAM. Amazon has increased the on board memory to accommodate Audible files. Memory size starts from 8GB and goes up to 32GB. Including the new Oasis, four versions of the Kindle will be available for sale: the Kindle original, the Paperwhite, the Voyager and the Oasis. Prices for Oasis starts at $249 for 8 GB and an additional $100 for 32GB. Shipping will begin on October 31st, but preorder is currently available.